3D Broadcast Ltd is a well-established professional broadcast company based at the world famous Pinewood Studios, who have many years of experience selling into the Broadcast and Corporate Market Place. The Directors Martin Joannou, Paul Raeburn and Philip O'Marra have established a fantastic reputation within the industry for quality and service..
3D Broadcast offers professional, impartial and unbiased advice to help you make the right choice in acquisition, post-production and media distribution solutions. With an ever growing international client base including freelancers, educational establishments, independent production companies, major corporations and broadcasters, 3D Broadcast is able to source and supply equipment from major manufactures that include Panasonic, Sony, Canon, Ikegami, Blackmagic and Vitec group as well as many others. It is our aim to offer a complete service, at competitive prices and above all to offer you a pleasant and pleasurable experience when dealing with 3D Broadcast. 3D Broadcast striving for excellence. The studios are in close proximity to all major UK airports. Take the A4 from Hyde Park Corner through Knightsbridge out of town and pick up the M4. Leave the motorway at Junction 5 following signs for Slough / Maidenhead (fourth exit off roundabout). Continue along this road (A4) for approximately 500 Yards until you come to a major junction of traffic lights with the “Marriott” Hotel on your left. Turn right, straight through Langley Village, following the signs for Iver. Continue until you reach a small roundabout with “The Red Lion” Public House on your left and turn left into Wood Lane. Continue on (approximately 1 mile) until you reach a large roundabout with “The Crooked Billet, Out & Out” Public House on your left. Take the second exit into Pinewood Road (signposted Pinewood Studios) and the Studios are 1 mile further on, situated on the left. Pinewood Studios have two entrances, Double Lodge and the Timekeeper Gate. All visitors should enter via Studio Drive and report to security at Timekeepers Gate. From the motorway exit slip road you will come onto a roundabout and should then take the road signposted A412 Slough (second exit). After about 2 miles you will approach two mini-roundabouts, go straight over both of these with “The Stag & Hound” Public House on your left. Continue along this road until you reach a large roundabout (approximately 1 mile). Take the fourth exit of this roundabout, Pinewood Road (signposted Pinewood Studios). The Studios are 1 mile along this road situated on your left. The nearest main line stations are Gerrards Cross or Slough. From Marylebone take the Chiltern Line overland train to Gerrards Cross. The journey lasts approximately 20 – 30 minutes. It will then take 10 minutes by taxi (based at the station) to reach Pinewood Studios. From Paddington take the Thames Train or Great Western to Slough. The journey lasts approximately 20 – 30 minutes. It will then take 10 minutes by taxi (based at the station) to reach Pinewood Studios. The nearest Underground Station is Uxbridge. From Baker Street take the Metropolitan Line to Uxbridge. The journey will last approximately 45 minutes. It will then take 10 minutes by taxi (based at the station) to reach Pinewood Studios. Further information on Train, Bus and Underground services is available on 02072221234. National Rail information is available on 0845 748 4950. The following list is a selection of local amenities and suppliers. It is not comprehensive and no Pinewood recommendation can be implied by inclusion of the list. 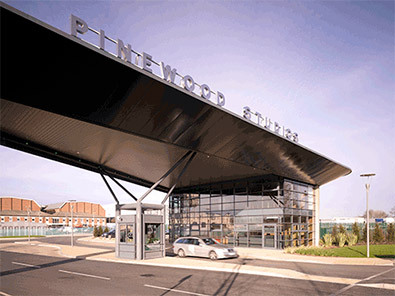 The Studios operate a free shuttle bus service to local underground and mainline stations for all Pinewood & Shepperton staff, Studio tenants, production staff and visitors. The service is part of a Green Travel Plan currently being implemented at the Studios. Buses operate between the hours of 0700 to 1900 Monday to Friday (excluding Bank Holidays) and run between Pinewood Studios, Uxbridge Underground station and Slough station. Admission to the bus is upon presentation of proof of identity or other authorisation (visitors must be issued with a letter or email authorising them to use the shuttle service). Television audiences for shows at the Studios may also use the service upon presentation of a ticket or invitation.